No matter where your student lives in Paris, you can count on having certain things right in your neighborhood. Here’s what your student can expect to find nearby when they move to Paris. Supermarkets. Students won’t have to worry about having a supermarket nearby: Paris has them all over, even in residential neighborhoods. Many Parisian grocery stores are on the small side, but they’ll have all the essentials. Some of the major grocery store chains include Carrefour, Franprix, Monoprix (larger locations also include home goods, clothing, and cosmetics departments), and Casino. Bakeries. France boasts one bakery for around 1,800 residents. In densely populated Paris, this means there are a lot of boulangeries around! Parisians love their fresh bread, so students can be sure that a crusty baguette or a pain au chocolat will be just a short walk away from their apartments. And if you are interested in trying one of the very best baguettes in the city, you’ll find 2018’s list of Meilleures Baguettes de Paris here! Pharmacies. If you need any kind of medication, even over-the-counter medicines, you’ll have to go to a pharmacy. And unlike pharmacies in some countries, French pharmacies only carry medical and specialty personal care products. You'll find more standard personal care products like shampoo, soap, deodorant, etc. in any grocery store (such as Monoprix). Pharmacies are easy to find: they all display a green cross above their doors, usually brightly lit so you can spot them from a distance. Paris has several pharmacies that are open all night long. Lots of visitors to Paris like to go to Pharmacie Citypharma, where you can buy popular French personal care items at a discount. Outdoor markets. 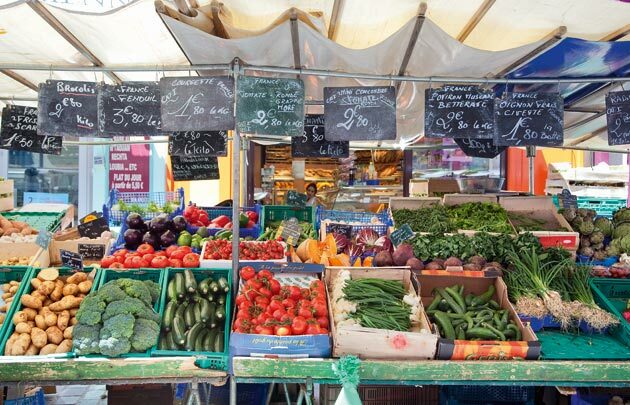 One of the best places to get the freshest products is at one of Paris’s many outdoor markets. These are typically open one or two days per week, from around 7:30am to 2:00pm, and are a great place to buy fruits and vegetables, cheese and other dairy products, meat, fish, French regional products, and some prepared dishes. Here’s a list of some of the best Parisian outdoor markets. Specialty shops. Paris has a rich choice in shops specializing in one type of project. Almost every neighborhood has its own fromager (cheese shop), primeur (greengrocer), wine shop, boucherie (butcher), poissonerie (fishmonger), as well as other specialty shops. These stores are where you’ll generally find the best products, as the shopkeepers take pride in offering high-quality merchandise. Here are some ideas of specialty shops to get you started.